A Maldivian policeman charges with a baton towards protesters after the government declared a state of emergency, in Male, Maldives, Feb. 6, 2018. The Maldives, which is known more for its luxury resorts, has become an increasingly important part of China’s global trade and infrastructure project, the "Belt and Road" initiative. It is also seen by analysts as a key strategic outpost in the Indian Ocean, despite its close proximity to India. The judges were jailed after issuing a surprise ruling that called for the release of imprisoned opposition politicians. 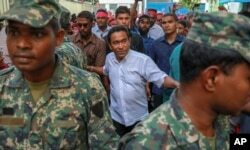 The growing number of arrests has sparked outcries from international rights groups and in a phone call late Thursday, U.S. President Donald Trump and Indian Prime Minister Narendra Modi "expressed concern about the political crisis in the Maldives and the importance of respect for democratic institutions and rule of law,” according to a White House statement. According to the statement, Wang Yi told the official that China believes the Maldives government and people have the "wisdom and ability to appropriately handle the issue facing them and return the country to normal order in accordance with the law." And in a remark apparently aimed at the growing international chorus and the United Nations against the Maldives government’s actions, he also said: "China does not interfere in the Maldives' internal affairs, which is also an important criterion of the rules of the United Nations charter." Maldivian President Abdulla Yameen, center, surrounded by body guards arrives to address supporters in Male, Feb. 3, 2018. But, while Beijing has significant economic interests in Maldives and strategic goals as well, the island nation is still well within India’s geopolitical orbit. Earlier this week, Nasheed, who has taken up refuge in India, urged New Delhi to send an envoy to the archipelago, "backed by its military." 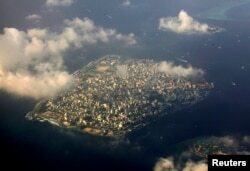 He also asked the United States to "stop all financial transactions of Maldives regime leaders going through U.S. banks."